Okay, I might have a reason to like Ram-Leela that gives me a bit of a bias, but I simply haven’t enjoyed a film this much in ages. Colourful, engaging, and full of life, this film captures the attention and the heart. Bollywood has not been high on my list of priorities, but this film could well change that. Their energy and obsession with colour has always fascinated me, but the plots can be pretty ordinary. Since Ram-Leela borrows the bulk of its plot from England’s foremost dramatist, it can hardly be said to suffer from this illness. 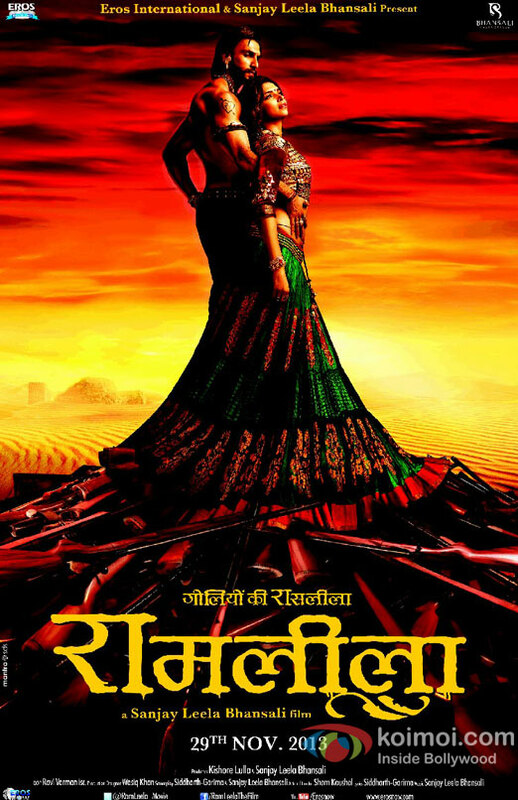 Based roughly on Romeo and Juliet, Ram-Leela begins with the familiar style of Bollywood. It is not long, however before it delves deeper into the characters and their backstory than is customary, and the challenge becomes to recognise Shakespeare’s characters in those in front of us. This is not, however, a straightforward transliteration. In transplanting the story to India, the plot required some major reconstructive surgery. It takes some interesting turns that are not quite what I was expecting, and in the second act I was beginning to think the plot had diverted completely from Shakespeare’s when it finally resolved back into the familiar run. This is where I really found myself fascinated. Some of my readers may be aware that some years ago I was involved in writing and directing a re-imagining of Romeo and Juliet in which the lovers live and rather than finding a happily ever after they find they don’t really like each other quite as much as they thought they did. Ram-Leela looked for a while like it might head down a similar path, but it didn’t, and I breathed a sigh of relief in a way. I can’t think of a more interesting experience than seeing this film in the heady mix of cultures I am experiencing here in Timor-Leste. It just sits beautifully in this eclectic place and should not be missed.